We spent the weekend down at the lake. We had a great time, but after 2 nights of about 5 hours sleep, I'm exhausted. Seems little Max wasn't quite sure what was going on and decided to party all night. So, I'm going to bed, but have been dying to pop my card in the computer to get this picture off of my camera. The dress that Charlotte is wearing is a dress my mom made for my little sister Rachel. Rachel is now 25. So, this dress is 22 years old? When my mom gave it to me I asked her if she still had the duckie pattern. She did. So, she set to work making Maxwell a matching outfit. All I wanted out of this weekend - besides awesome family time (of course!) - was this picture. This makes me SO happy. It will be printed large for my walls. That picture is amazing, definitely worth a frame! We missed you for Easter! Dang, you guys make cute kids. Such a great picture of them. 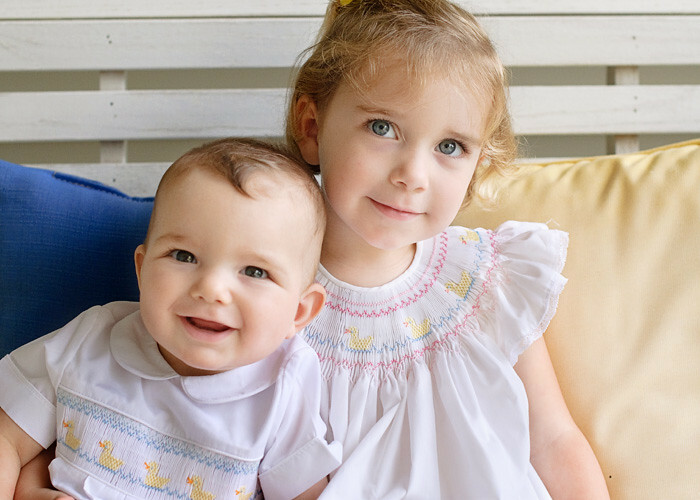 Don't you just love that the smocked clothes are some timeless and can be worn generation after generation. My girls have some things my mom made for me years ago and I just love when they wear them. LOVE the matching ducks.